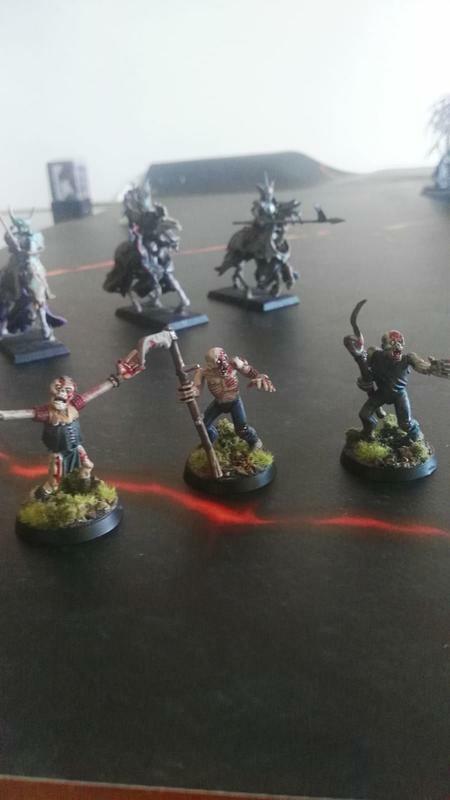 This is part of my army, in my country have the ancient bases aren't a problem. 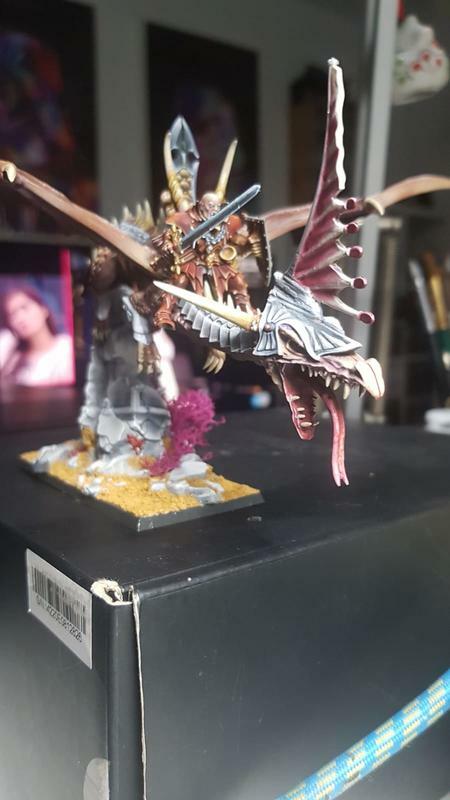 My vampire lord in zombie dragon is a simple "conversion" with aelve dragonlord. 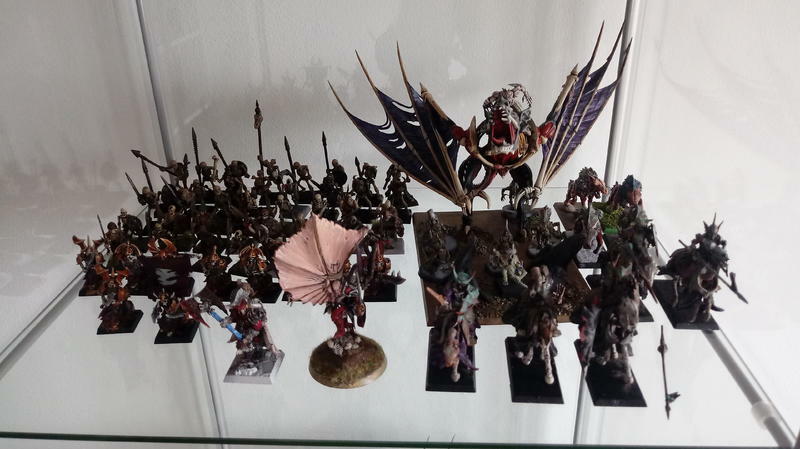 Also, i have other coloured miniatures (as Bloodseker palanquin or mortis engine) and standard vhordrai, Neferata, Arkhan, etc without paint. 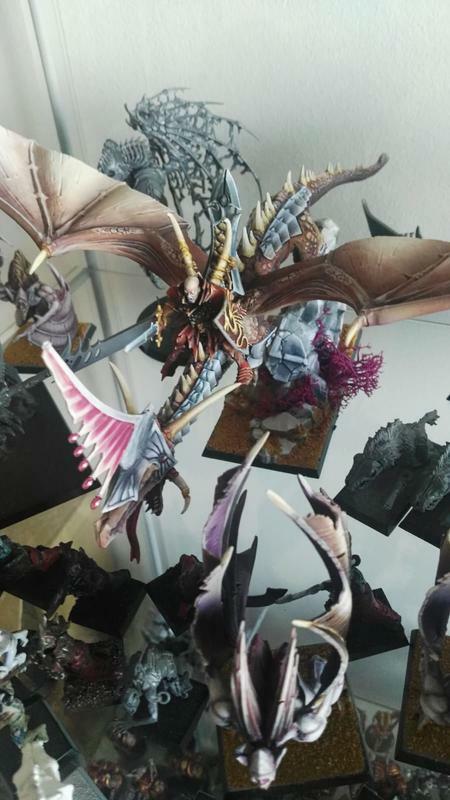 I realise that Prince Vhordrai does not have the keyword Vampire Lord (and FAQ side did not state anything). 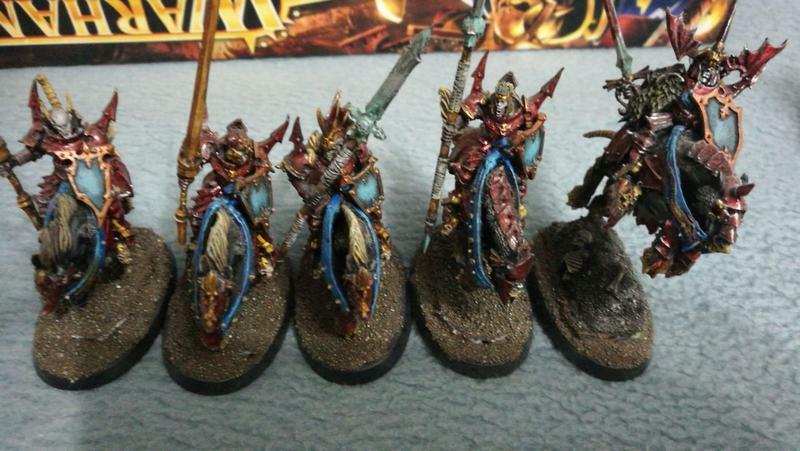 So am i correct to assume that the Legion of Blood "Favoured Retainers" does not apply to him? There are no changes to his keywords anywhere right? So this happened this weekend. 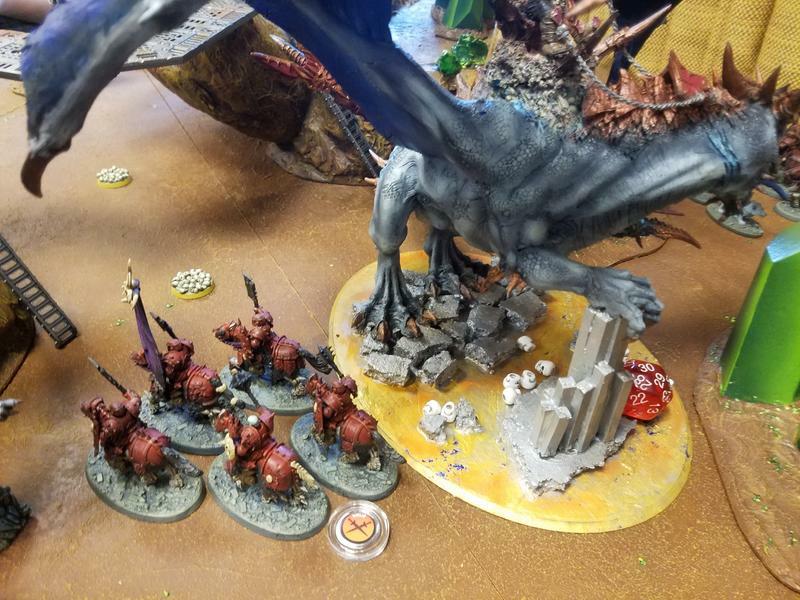 Dragon took out those Blood Knights but then got charged by another 5, the VLoZD, & 2 Vamp Lords. Popped the Orb of Enchantment and then proceeded to kill the Dragon. 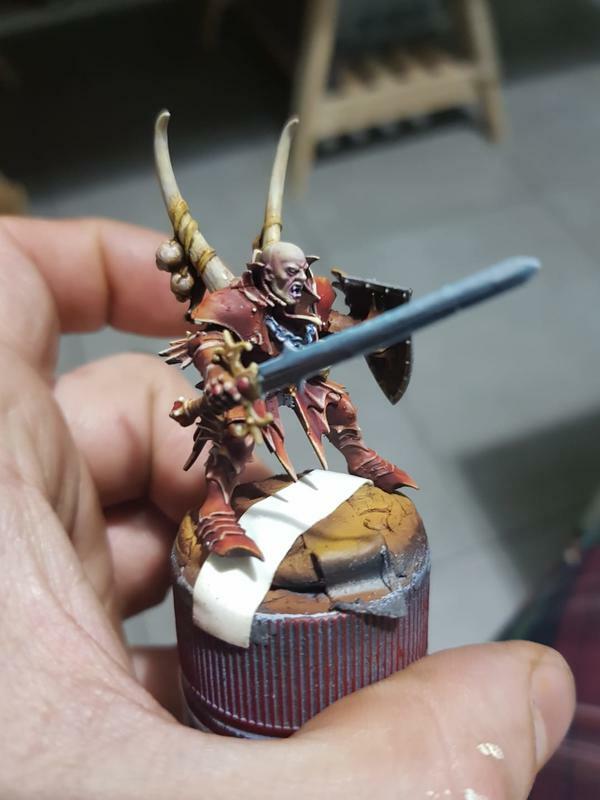 Tomorrow i have a 2000 points battle versus a opponent with the new skaven batteltome (i don't know his list). I think that is better use 5 blood knights or change theirs for Covern Throne. What do you think? I think that the covern throne is better because of the hypnotism versius one army with a poor bravery. But they have high magic available... might get unbinded. Hey guys, I was thinking about the best way to play Vampire Lord on ZD. Two most interesting combos I thought about are: Legion of Blood (+1 attack), Blade of Endings (+2 to Damage on a hit rolls of 6+), Walking Death (Legion of Blood battle trait). The Second option is the same but with Ghyrstrike (+1 to hit and to wound). Do you guys have an idea which one is stronger? Maybe you have a anorher idea ot some extra combo on top of that? The way the VLoZD sees most play is alongside Prince Vhordrai or another VLoZD in a "double dragon" formation. The most used kit out is the minus one to hit Legion Of Blood command trait plus the Ethereal Amulet to give him a +3 unrendable save (that can re-role 1's if you get Mystic Shield off). This makes him pretty tough to deal with outside of mortal wounds. Looks very interesting. I kinda took my Ethereal of NH for granted xD. My focus was to make a VLoZM deal as many wounds as possible kinda forgetting that he’s pretty easy to get killed this way. 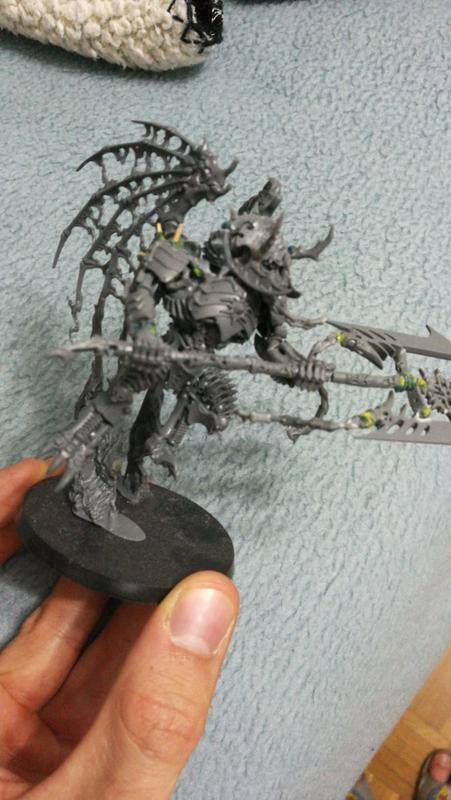 Another interesting way is to have him in Death allegiance army with Red Fury and Ring of Immortality. This way he’s able to pile in twice and possibly can resurrect, only down side is that’s not reliable. 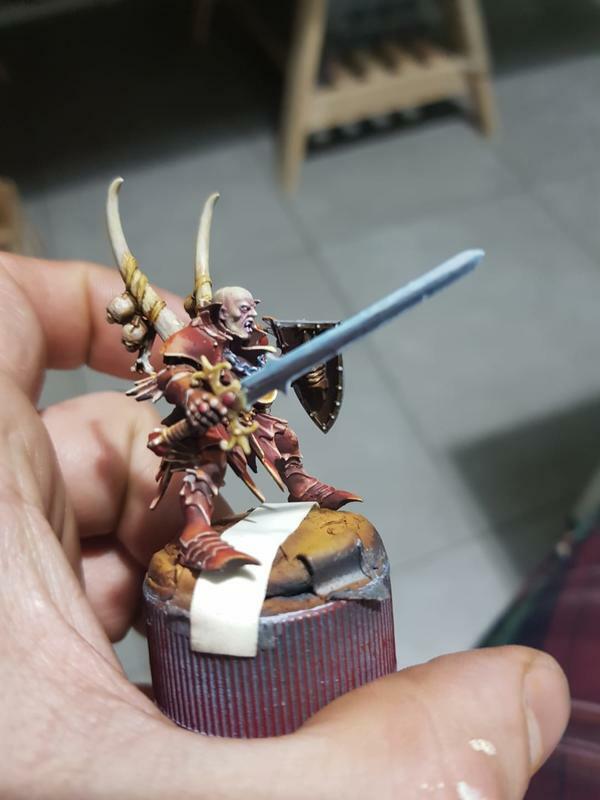 Another interesting way is to have him in Death allegiance army with Red Fury and Ring of Immortality. This way he’s able to pile in twice and possibly can resurrect, only down side is that’s not reliable﻿. With prince Vhoradrai, your VLoZD can pile and attack in the hero phase. Very aggressive. He destroyed my entire army, i only kill his warpfire throwers. The part consisted in control with units 3 objectives in the center of the table separated 18" among them. ¿What programme similar to paint use the people for explain the summary of the battles? In order to show my ridicolous battle jeje. I run mine with Sanguine Blur for the +2 M, Pinions and the Orb of Enchantment. Basically looking to take out a key piece. I've found the Orb to be a hard counter vs some problematic stuff. 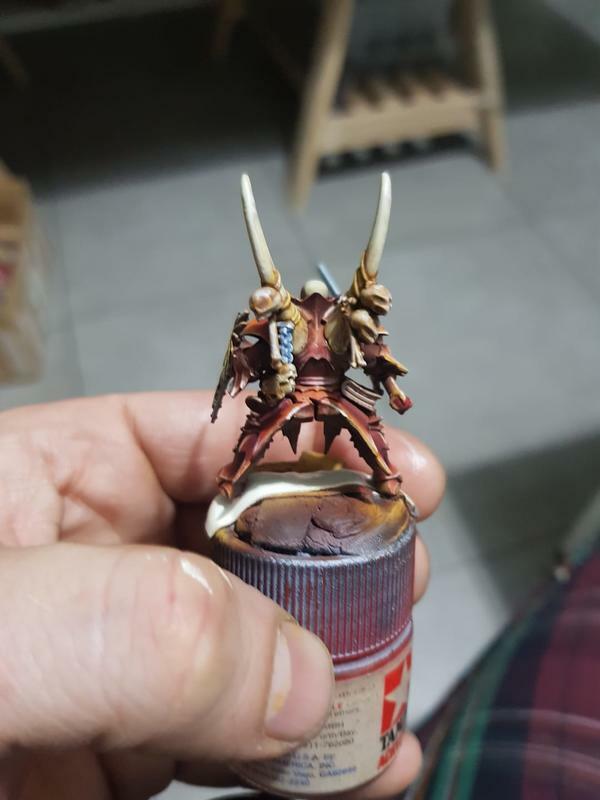 Blood Knights aren't exactly top tier so I like having an ace up my sleeve. With Gimp you could do that, but it would be a lot of work. 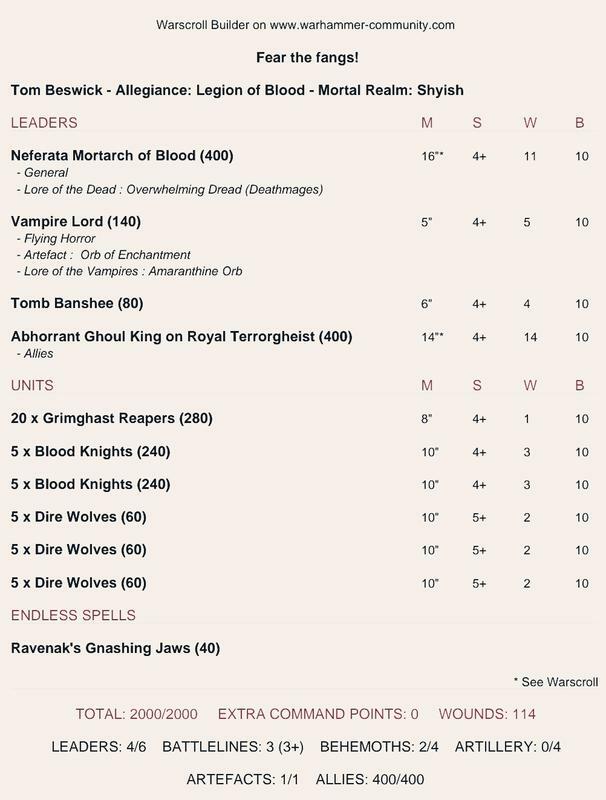 Been working on my Legion on Blood army for several months now and I'm close to having these lists built, I'm not going for the most competitive or optimal list, I just wanted to use my favourite model, Neferata, and still be able to bring the fight. Because little pieces of plastic can be expensive I have built 2 variants of the list to help keep things interesting while only needing to swap out a few models. The "Fear the fangs" list takes advantage of the armies natural bravery debuffs without living and dying by the sword. So I think LoB is pretty well positioned against FEC. Granted I'm relying on the Orb of Enchantment to counter the Gristleghiest GKoTG but it is a decent answer. 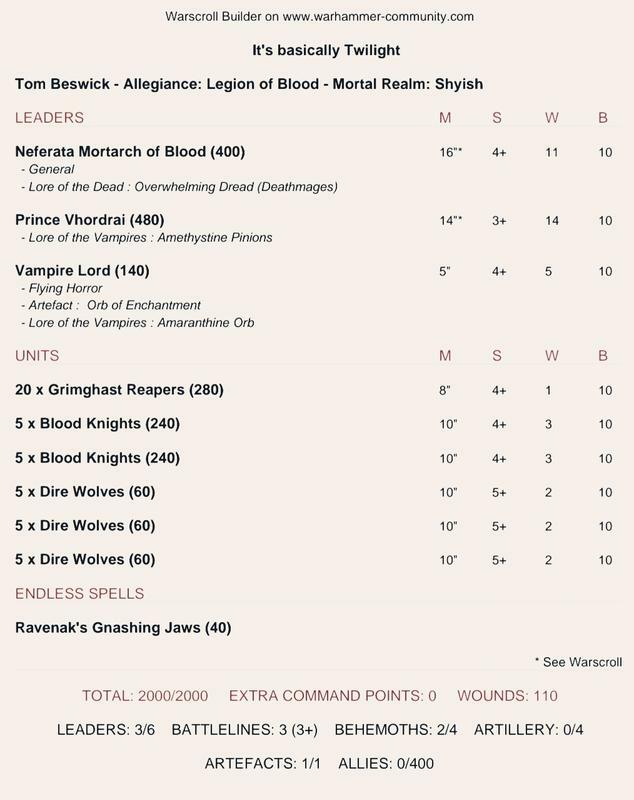 Then, Blood Knights have the damage output to drop big fatties. Thoughts? Sorry, I tried to use this program what i don't know how charge the army in the map 😫. For other band, i'm in a league of 2 battles of 1500p and 3 battles of 2000p. 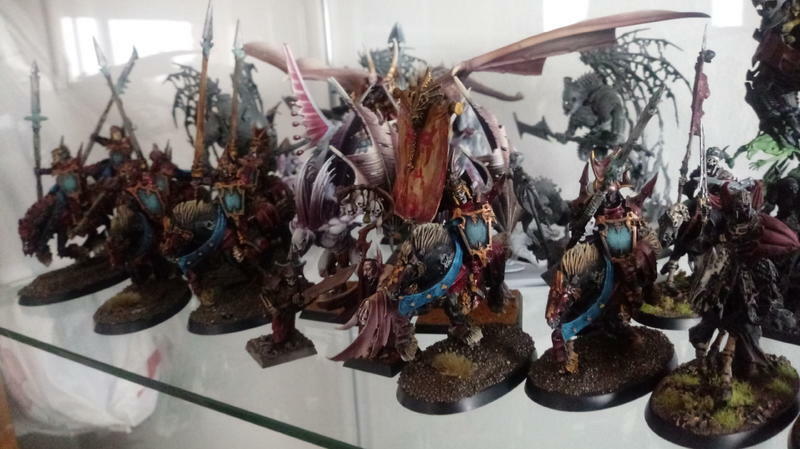 I play with legions and i can use anywhere of the 3 and grand host of nagash legions. I will inform you about my lists. Any idea of the use of covern throne or vargheists in a competitive list of 1500p? bedsheets might be more competitive, but I have personal issues with them. bedsheets ﻿﻿﻿might be more competitive, but I have personal issues with them. Oh... Can I use the ca of the covern throne for re-roll hit rolls of the Vargheist? I think that only can repeat one dice. I don't have the banshee and only have 3 Vargheists and 10 dogs, this week we will be buy 10 more.  Tactical Insight: pick a friendly death unit within 12“ and re-roll hit/wound/save rolls of 1 till your next herophase. But, today i read in Tactical Insight: The legendary scrying talents of some vampires, aided by their vantage point above the battlefield, allow them to assess, disrupt and take advantage of enemy plans. If a Vampire Queen atop a Coven Throne uses this ability, and the dice rolled at the start of the next battle round is a tie, you can decide who will take the first turn of that battle round. And in the faqs i don't read this modification to repeat rolls of 1 in hit/wound/save.